The "Shark Attacks" have a proper medical characterization that has been observed and diagnosed clinically in other patients. NOT necessarily all dismissed as mental cases! This from Dr. Digre at the Moran Eye Center at University of Utah Hospital Clinics. She is a Neuro-opthamologist specialialist of long standing and experience. After an examination of some hours, and help from a couplof assistants, this was the initial diagnosis. Her recommendation was drug therapy that further relax cerebrovascular elements that are spasming to cause the "Shark Attacks". 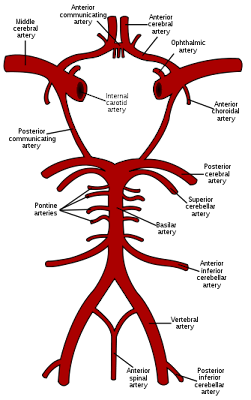 Relaxing the basilar artery will result in an overall increase of blood flow to the brain stem in general, hopefully resulting in reduction and eventual elimination of the condition that results in syncope and spasms. This is the first good news. In addition, initial eye testing revealed other problems that may exacerbate trigger points for migraine. Special eyeglasses with filters and corrective lenses were ordered. Hip Hip Hooray! Just to find a name for it, and than a treatment, too. Good luck, hope it helps! Our extended family needs a serious examination of this condition and the issues, all of us, becuse basilar migraine is strongly linked through genetic lines, and has very serious implications. Silly Cindy here, who still doesn't know how to do this "right"! I'm checking right now, on this kind of Migraine, on the internet. I really think this may be what has caused Christians troubles--and he's so much younger than you! He has only had two really serious attacks (that we know of), but we do need to get it figured out what is causing him troubles. It will be an interesting search...Thanks for the "guinea pig" info! It has been a hard "row" for you, but if we can find some answers that help many of us...well, I appreciate all the more how well you've mananged to deal with all of this. Excellent, Jim. Can't wait to see what opens up for you. Very best wishes on this phase of your explorations. The incident with Christian is exactly what I was thinking of. The basilar migraine syncope is most rare, but is manifested in young people. Most doctors have never heard of it, and think you are nuts to even talk about it, but what has been happening in your family needs to be looked at with this line of thinking in mind. It may not be of any concern whatsoever, but can have very serious imlications. The preventative measures are not diffict or burdensome. It can have big impact on quality of life for future generations. In other words, definitely worth following up on! If your kids have any tendency toward headache complaints or migraine, please don't ignore this. Not to put too frightening a note, but be aware that unattended, some children suffer from an initial basilar migraine syncope, enter a coma, and never recoer. What I have discovered in initial returns from research is that the basialr migraine is exceptionally rare, and that it has very strong genetic ties. Both sidesof my family carry genes for migraine tendency, so it meets in my parental line reinforced twice. I was lucky enoough to have some kind of trauma or event that caused my already insufficient basilar artery flow to be diminished late in life by atheosclerosis and ischemia -- and further exacerbated by stroke brain stem stroke. How amazing that I am still alive! That is the part that defies any attempt at simple rational explanation. It is remarkable that you're still alive, Jim. And while various miracles and other kinds of intervention, divine and human, have counted well toward that, I think some credit should go to you, too, for fighting a good fight. What is the connection between the eyes and the migraines? What kind of filters are prescribed? One of the things Dr. Digre proposed is that I have a particularly "sensitive" brain. I think she was being tactful. What she meant was "easily annoyed, exasperated, irratated, and vaporlocked by trifles that would not normally bother an ordinary Joe". One of my particular problems is a vision defect that has me seeing multiple images of everything. It irritates and concerns me slightly, but I have grown to deal with such distractions. The glasses also are tinted to reflect a particularly annoying light noise frequncy that my eyes are sensitive to, but most do not see at all. The tests confirmed this, I could detect oscilating lights at higher freqauncy that normal, high above the normal 45Hz rate, and certainly above the 60Hz rate that fluorescents generate, and the rose-colored glasses are desiged to filter out. I purchased a computer monitor some years ago that has a higher video screen refresh rate for this very reason, because the older tube gave terrible headaches after prolonged sessions. They didn't bother other people, but for some reason, I am special. So, the more I've read the more I think Christian is having migraine trouble, and has had for a long time! We just didn't know what we were looking for. One of the sites I read had info on "abdominal migraine", a childhood problem which Christian may have had since about 8 or 9. He was in the ER twice in one day his pain was so terrible, but no cause showed on the tests they did then and they sent us home with a diagnosis of "gas". For a couple of years he's gotten sick (vomiting) when we went camping, without any explanation, but may be related. Then of course, his trip to Primary Childrens a few years ago and this last episode on New Years eve. More to read up on, but it sounds very plausible. With Neil, Michael and Daniel also having headache problems, I kind of feel I need to line up each of my kids at some Dr. specialist office and have them all checked out! Thanks for your info and help. Cindy, you really should try to get Christian evaluated by Jim's headache specialist--it sounds as if she knows her stuff. Thank you for the caution Jim. We aren't assuming too much, and almost never move very fast to get things done! :-) I do think it wouldn't hurt to look further though. Ruth gave me the number for Moran in SL, but I don't know that we want to have regular trips there--lazy me! Just more info to study is helpful. Thanks!